Beautiful large sterling silver shamrock w/sterling silver Puppy Paw®. This Puppy Paw® can even be made into a Mother's Paw® that can hold 7 birthstone crystals! 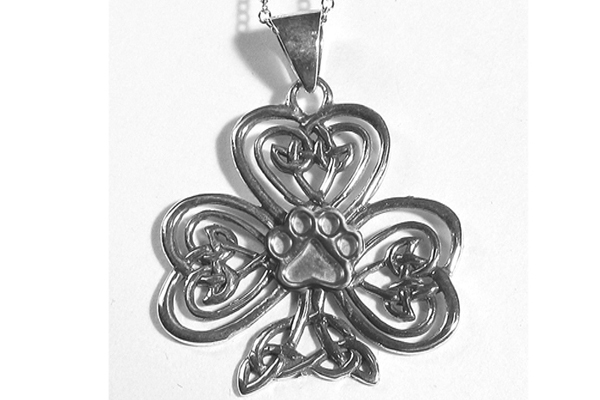 Sterling silver large Celtic Shamrock Pendant w/Puppy Paw®. Comes w/an 18" sterling silver chain pendant measures about 1 1/8" x 1 1/2. The image is enlarged to show detail. This sterling silver Puppy Paw® Pendant comes w/an 18" sterling silver chain pendant & takes about 1 week for delivery. You can add 1 to 7 birthstone crystal(s) which makes it into a Mother's Paw®. The guide is for your convenience to use as a layout for your crystals. If you only have 1, 2 or 3 dogs you are invited to return the piece to me when you acquire a new pet so you can keep your Mother's Paw® current.